Menu item for reminding you of scheduled events. Is there a better alternative to Notificant? Is Notificant really the best app in Personal Info Managers category? Will Notificant work good on macOS 10.13.4? Notificant makes sure you always remember what you want to. 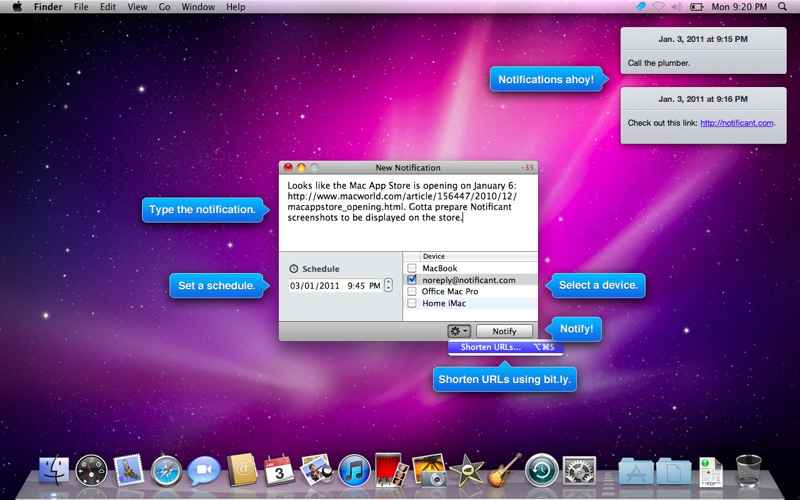 It alerts you with scheduled reminders and has the ability to shuttle notifications across different Macs. Utilizing a free Caramel Cloud account, Notificant can create notifications that can be fired at a scheduled time on your current Mac or on any of the others you own. It lives in the menu bar and stays out of your way until you need it. The simple UI makes it a cinch to create a notification within seconds. Ability to rename devices from the Web app. Notifications now fire even without an Internet connection. Few minor bug fixes and improvements. Notificant needs a rating. Be the first to rate this app and get the discussion started!